While concussions can be insidiously dangerous for high school football players, young athletes are sometimes hardheaded about their safety. A group in Boston pushes for widespread education on the issue. their safety over playing time [Credit: Herald Post, flickr.com, remixed by Shelley DuBois]. When Ahmad Ahmed bashed helmets with his teammate during football practice this past fall, he didn’t even think about telling his coach. “He would have said, ‘Come out,’ but I didn’t want to do that,” Ahmed said. The broad-shouldered, good-looking leader of the Brooklyn Tech High School team was so full of adrenaline that he didn’t feel the hit. Good athletes play through a certain amount of pain, but the consequences of playing through a concussion can be catastrophic. Now, a group in Massachusetts led by ex-wrestler Chris Nowinski works to convey this message to school administrators, athletes and coaches across the country. The organization, called the Sports Legacy Institute, or SLI, has also partnered with doctors at Boston University to research the elusive dangers of chronic head injuries. But this new group is competing against one of the oldest adages in sports culture. So he didn’t know that continuing to wrestle after a hit he took in a 2003 wrestling match would end his career. After years of damaging blows, Nowinski’s final concussion, compounded with the effects of his other injuries, forced him to retire. “Months later, I learned during my recovery process that all the blackouts I’d been suffering, and hits that had caused me to see the sky go orange or forget what I was doing, were actually concussions,” he said. Now he provides athletes with the information that he didn’t have. In 2006, Nowinski, who has suffered from chronic headaches, depression, and memory loss, founded the SLI. The organization educates athletes and coaches about the brain damage, also called encephalopathy, triggered by concussions. The education outreach section of the SLI website provides online seminars, literature and head injury information from the Center for Disease Control and Prevention, or CDC. Nowinski speaks at conferences and coaching clinics. He says that young athletes are particularly at risk. 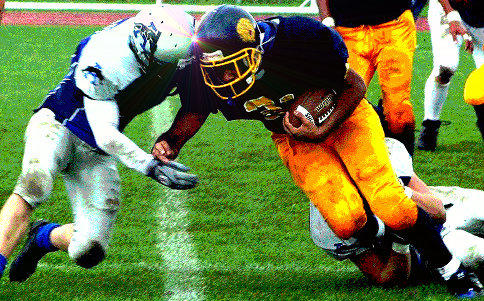 Football players account for 60 percent of concussions in all high school athletes, according to estimates from the CDC, but that’s a rough guess. “Nobody’s ever counted how many concussions happen in high school football players,” remarked Nowinski, “it’s outrageous.” It would be a huge task—concussions are difficult to tally. The term encompasses any injury that somehow alters brain function. In all concussions, the initial impact shakes the skull. This jolt disrupts the way that long slender parts of brain cells, called axons, signal to each other. The axons then enter a frantic state of repair for about a month. During this time, they are extremely vulnerable. If an athlete plays too soon after a concussion and receives a second blow to the head, many of the axons will dissolve completely, destroying clusters of cells. But it doesn’t even take a second blow to harm these axons. Engaging in any mentally or physically stressful activity after a concussion can exacerbate the damage, like continuing to play during football practice in Ahmed’s case. Despite the risks, up to 80 percent of sports-related concussions go unrecognized, according to Boston University neurosurgeon Dr. Robert Cantu, one of the founding members of the SLI. Way to go Shelley!!! Nice article. Keep sending them. Andy and I will be in NYC March 6-8 going to 3 plays. Are you free for brunch on Saturday or an early dinner on Friday? The brain’s inertia causes it to smash against the inside of the skull, near the base of the skull. i just love how you have to sound so intellegent just because she didnt discuss boxing. Just because she didnt discuss every concussion you can get doesnt mean its a bad article, oh and dahszil maybe you should keep your “wonderful prodigy talent” offline eh?